Decorative Life: Individual flower may last from 4-5 days depending mostly on cultivar and temperature. 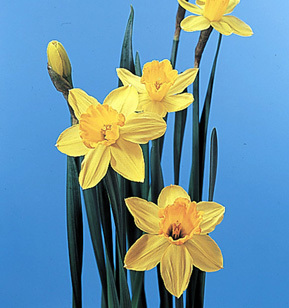 While it is fairly common for some growers treat potted daffodils with ethylene in the form of liquid Ethephon (Ethrel) to reduce postharvest plant height development, this procedure is less common for cut daffodils. Harvesting flowers in the pencil or gooseneck stages is recommended even though flowers harvested fully open actually last longer. The reason that tighter harvest stages are recommended is to reduce damages induced during packaging and transport. However, for homeowners picking flowers from their gardens, fully open flowers would be the best harvest stage. The more the air movement in areas where this species is being grown, the shorter the stem (peduncle) length. Storage at 32-33 F for up to 10 days, 36-38 F for up to 8 days, store dry (preferred) or wet but keep stems upright to prevent stem bending (geotropism). When ‘King Alfred’ (a cultivar no longer available) was held wet or dry between 32 and 50F, no difference in vaselife was noted between wet and dry at a given temperature. However, there was an advantage for wet holding when held at 55F. Therefore, dry storage/transport is recommended unless high temperatures (>50F) are possible. Most bulbs used for producing daffodils are grown in The Netherlands. The American Academy of Allergy, Asthma and Immunology list this species as an allergy-safe pollen producing plant. Can be grown in homes using just about any growing mix (even gravel) because the bulbs contain essentially all of the nutrition and therefore only need water, light and carbon dioxide (from air) to grow and flower. Regardless of the growing mix uded, care should be taken that they are planted deep enough such that the roots do not push the bulb, stems, leaves and flowers out of the mix resulting in a plant that can easily topple over! Flowers should be purchased before the flowers unfold between when they are straight up (pencil) to just bending over (gooseneck) stages.